Mordian 7th Regiment: Tzeentch Renegades - Color! Glorious color! Hah! I've had a small allied chaos force lurking on the shelves for over a year now, figured it was time to give them a little attention. First up is a squad of chaos marines dedicated to my favorite of the Big Four, Tzeentch. Squad of nine of course, which denies me a heavy weapon but between the sacred number and the Icon of Flame, Tzeentch will certainly grant them his favor! While I was at it I worked on the sorcerer, though I'm not at all happy with the state of his face at the moment. That's going to be getting a re-do post haste. Finally, a quick (and frankly terrible) shot of the painted army so far. Still in the wings are a unit of Thousand Sons (of course), some screamer riders, a FW Helltalon, and some allied Tzeentch daemons. I'll likely give the two marine squads Rhinos, but I think that'll be the extent of it - This will not(!) turn into another 3000+ point army, darn it! ...It's the Heresy Thousand Sons army I'm scheming on that will! I'm planning to do a couple little 500-1000 point allied forces s for the guard this year, including finishing up the last few Eldar that I'd kept from the previous project, some "Deff Korps uv Kriek" orks and perhaps an Inquisitor's warband or two. Not to mention the aforementioned heresy era Thousand Sons! With the rumors of new guard on the horizon as well, looks like 2014 is going to be a fun year for hobbying! Very Tzeentch-y indeed. Kind of old school Realm of Chaos type scheme to me. Appropriate, but vile and offensive to this old follower of the Plague God. AHHHHH! Oh Gods - my eyes it burns! The color burns!!!!!! What i made out before being blinded looked nice with the contrast between the blue and yellow. 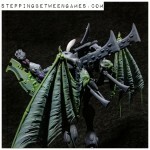 That is truely a jump from one extreme to the other - very 90's 'eavy metal styling going on there. The Dark Vengeance Chaos Marines and Cultists are sweet minis - its good to see a set painted up. Though I am with Dai being in the Nurgle camp myself - could do with a bit more green and mucous. so much more interesting than endless khaki. They really are a splash of colour ! Nice job on the yellow as well. But there was yellow on your Alatoic so you have had recent practice. @Dai: Hah! That's what I was going for! @Frothing Muppet: Cheers, mate! Papa Nurgle is definitely my second favorite, there may be some of his followers in the future! @Zzzzzz: Definitely went a little overboard with the bright colors, but it was very therapeutic! @Stephen: Too right, man! It's been frigid here of late, too! Man you can always see your armies on tables from a mile away. Either bright red, or bright yellow. Heh. Mordian, have you tried using kanbanflow? Google it. 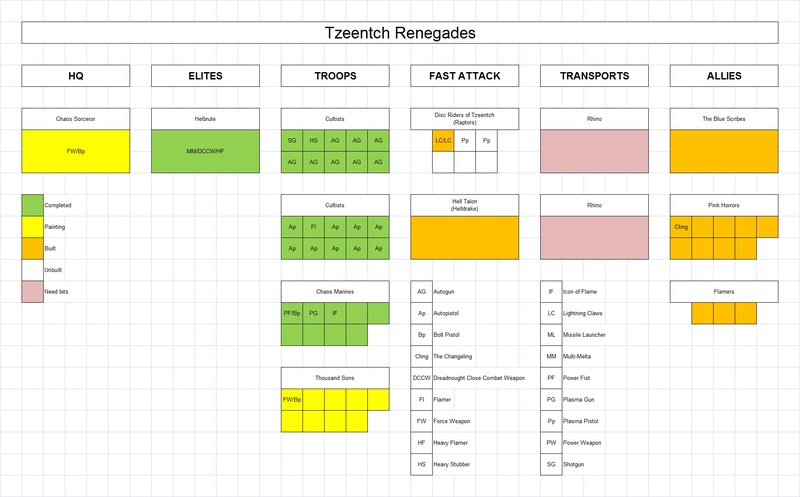 I am using it to plan my armies now and it works wonders as it helps you break down what you need to accomplish.